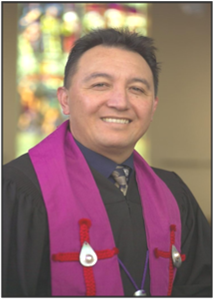 After a 13-year ministry at First Church, Dunedin, as senior minister, The Rev Dr Tokerau Joseph is returning with his family to Auckland, where he was raised, to be our Minister. He is looking forward to be closer to his extended family in Auckland. Dr Joseph was born in Rarotonga. His parents were Otiikore Joseph from Manihiki and Joyce Joseph from Rakahanga (Nee Henderson—related to Malcolm and Raewyn of our parish). He came with his family to New Zealand in 1969, living in Grey Lynn, then South Auckland, before moving to Dunedin to train and then serve as a Minister. His PhD research was an exploration of ethnic relations in congregations of the Presbyterian Church in New Zealand. His research found that, although churches often profess to represent a range of ethnicities and cultures, that is rarely the case. He suspects this is because it simply requires less effort to be with a familiar cultural group. Mairangi-Castor Bays Presbyterian will be extending our horizons! Located between 11 Hastings Road and Penzance Road with vehicle access from Penzance Road.